around the world ---- CLICK HERE ! ,,,Anton said "I like my city,Minsk." ,,,Natasha said "I'm from Soviet." ,,After all,most of Lithuanian people's reputation about Belarus was useless for me.Yes,here is different from Lithuania,but it's still not much,,just I want to say that Try to go to Kazakhstan or Kyrgyz!? BELARUS WAS ALMOST LIKE GEORGIA FOR ME! My very first official(via Internet website(not CS) host sent me Happy Birthday mail from my most favorite Georgia,I'm so glad! It was too hard to leave from my dearest Lithuanian-CSer Milda,but anyway (11AM)start hitchhike from Kaunas! WHY I ANSWERED HONESTLY THAT I CAME TO LITHUANIA ON OCTOBER?! immigration police caught me for a few hours and made document because I overstayed for 15 months in EU(Shengen-treaty)country,they said "You must go out from EU immediately",,,Yes,I'm a person who is going to go out NOW,What a strange word you're saying!? but "Anyway you can't stay here,Go out now" Yes,of course!?!? ,,They allowed me to not pay penalty because of my birthday,but anyway I was very late to see Victory day's parade in Minsk. Russian nice family drove me till heavy rainy Minsk,then connected and sent me to my CS-host,spaciiba!and they said "You can stay at our home in Moscow" great! ,,,(8PM)It's been 4 months since we started to contact but,Finally I met with Rimma,most loveliest CSer so far! I just asked at institute whether I can use Internet for free or not,but a student Slava helped me it and showed me city,even took me to Japanese embassy!? I was glad his poor English,I could learn Russian from him. Then,finally I could meet again with Ivan,we just met for 5 minutes in Vilnius before(not via CS),,,What a friendly guy!? He took me to luna park (playland for children),we tried to ride moonflying-machine(? ),,but it broken before start to move,,dangerous. (11,May),,Why I didn't find Belarus' CS-host except Rimma in advance because I was not sure even whether I can enter to Belarus or not,and wanted to change my travel way a bit for separate from computer,,but now she is so busy that no time to be with me at all,unfortunately I decided to leave her flat,OK I will travel Belarus with having dream to meet her again! .I've done REGISTRATION in Minsk easily quickly,but it's not interesting topic so that I don't write,anyway Thanks Ivan! and his sister! .Diana told me that her Internet is same costs however long she used,,after all I sent CSing mail to 100 Minsk people as usual of my way,through the night,,Sorry. Diana let me feel that I already satisfied to staying Minsk! ?she's an artist and also teacher of art(I stayed her shool with children artist)besides good hairdresser,Thanks for cut even to mine! So comfortable with her,but I continued to move to another hosts---they also have unlimited Internet,,,I continued to send CS-mails til morning. In sunny park,a student couple talked to me by Japanese language "Are you Mr.Ushi?! ",,,as result,Tonight I'm writing this blog at their flat!? 12,May,6:44)Ushi sent CSing request mail to Veronika. 7:37)Veronika answered mail to Ushi,but she was in Vietnam for study now!? 13:15)Veronika's Belarusian studymate Alyona(in Vietnam) copied and posted Ushi's mail to her own blog like "mission,mission,Minsk people!?". 17:21)Alyona's friend Anton (J-ROCK fan)in Minsk read Alyona's blog and posted it to his own blog. 13,May,14:00 around)Marina and Ilya found Ushi in the sunny park. After all,I continued to stay at their flat even cancelled meeting a CSer(sorry) until 20:00 because it was so comfortable besides we talk by Japanese! When I left there,Marina told me by Japanese"Please visit us again and again",I was moved. Tonight's host Peter was also super friendly and humorous,he lived in Tokyo when he was small child!? Peter even introduced me to his colleague who can host me. ,,Minsk is bigger than Vilnius,bus or metro are cheaper than Vilnius,but I still can't get used to using money,continued to walk much (because it's nice spring day! )so that I was tired,slept in bench although Anton was waiting for me at metro station even to be suspected by police(sorry).With his mates,Frisbee in the park until strong evening rain comes(everyday it happens). ,,On the roof of StarWars-biblioteka with green-Minsk view,Anton told me about gathering in Minsk for the anniversary of a popular J-ROCK artist's death,I was moved a bit although I didn't like the artist,,and my most beloved Japanese also died a same date in last year. ,,Anton said,"Minsk is big village",so that he knew about CSer who invited me rock concert in club,,,all of its atmosphere reminded me of almost of all of my life in Japan,I was not interested in drinking and smoking or lazy relaxed company,I was just mad about Rock-sound itself. ,,,Tonight's host offered me unlimited Internet,so I sent mails to all cities except Minsk through the night. ,,,but Sorry for continuing Internet until sunrise. My brain and body both are wanting rest,kept napping at chair of shopping center.People didn't lend me mobile,so tried visit a CSer directly,,with napping by pond.She was out but her small brother treated me,everybody is good Russian teacher of me:) She drove me to tonight's host but totally got lost(sorry). Host's couple are preparing to join to Rainbow festival,but their flat itself is already Rainbow festival! Interesting contrast artistic inside with ugly outside view of constracting new town. ,,,Sorry for late because of Rainbow but,visiting Anton's home and making Japanese miso-soup,it's really joyful for me!This is exactly Japanese daily taste(Sushi is not usual food,I didn't make it usually)!,,showing his mates various Japanese foods by Internet until 22:00,,Oh! late to go to host again(Sorry),cancelled it because I've found another (anytime welcome)host's place was just Anton's next building!? ,,when we go to sleep,"If it costs I don't ask Internet. "You can use as much as you want."? !Thank you but how long about? "Yes,5 or 10 minutes?"!?!? 9AM,visited Anton again.Since he told me that there's no check on Russian border,every night I have been dreaming about illegal Russian trip(now Japanese tourist can't get Russian visa except in Japan),I can't tell to anybody or write on blog such top secret but,tried to visit to its embassy for inquiry,but it was closed today. ,,,Though,in the evening I depressed so that they worried about me,Sorry but since first day of Minsk I don't remember when I rested from non-stop excitement?!? Oh,No!! It already half term of my Belarusian visa past but I'm still in Minsk!? Got invite from many cities' CSers,I should start trip soon!,,but maybe it already not much time left to spend in Minsk? it might be,,no meeting Rimma anymore? even don't know I can get back to Minsk or not?? anyhow suddenly I decided to surf again to Natasha,at least. ,,Natasha broke my personal jinks "Second meeting can't surpass strong impression of first time",I'm glad it! Yesterday,suddenly a CSer answered me "You can surf me Tomorrow" so I answered soon,then this morning suddenly "Sorry today I can't"!? Besides,just before I'm about to visit to friends,they sent me "Sorry today we can't"!? ,,,Of course,all Couchsurfers shouldn't have such case each other. ,,,As result,now I'm finding Tonight's host. After hard hitchhike,midnight my concert was performed excitingly at best club of Belarus!? 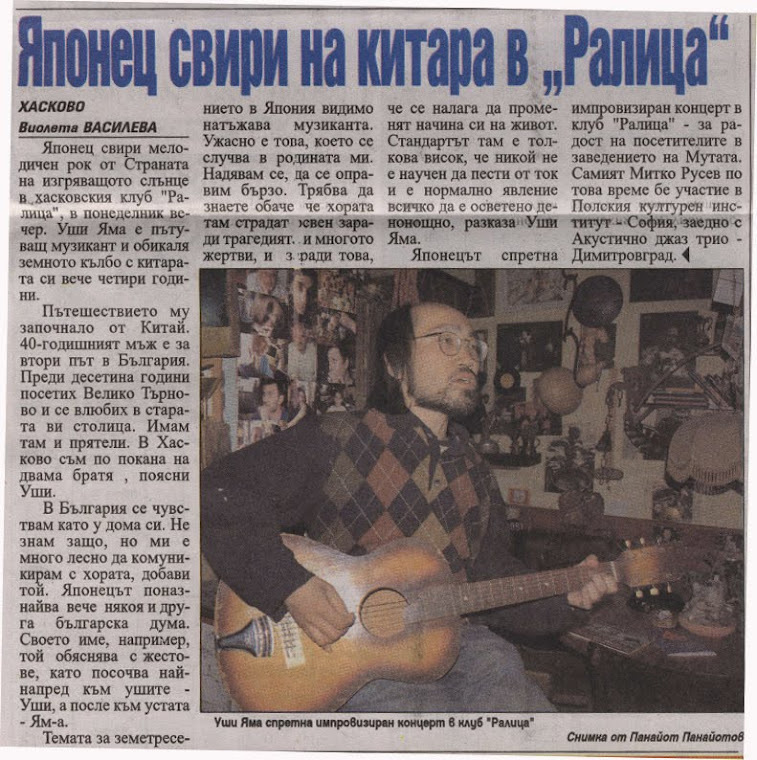 I sung with wearing shirt of Turkmenistan at Georgian owner's club,then I met with a guy from far-east Russia,or from Armenia,,,? !Suddenly I noticed the fact, How precious existence the post Soviet countries are in my life!!? ?,,I shed tears. Woke up in afternoon,as a result I arrived at Novopolotsk in sunset 21:45,,Sorry for Cser who waited for me to show city. ,,,How many years I have been hitchhiking so far(and will do)? Surfing to Natasha again and again. AAAHHH!!! I can't manage to contact with many Csers by e-mail through the night,anymore!I'm Sorry I couldn't meet You even though I sent you mail from me. my concert' date was decided on 29 Saturday evening in Minsk. ,,,after standing for hours in windy cloudy weather,finally the driver who is going to Lida(not to Grodna) picked me up,,,we have seen perfect double rainbows! finally I surfed to non-CSer who is mother of my previous host of Minsk,Thanks! Yesterday,the mother invited me Uzbekistan' plof,,delicious! Then,today also I was invited plof in Grodno!? I'm not sure I can go to Minsk tomorrow for my concert or not. I'm Sorry for cancel my consert today. I should prepare Ukraina-trip soon. Although I'm a traveler,I saw her off at platform in train station,it's strange feering. After her train left,my heart became vacant. Now I don't want to travel anymore,but I don't have my home. Love in vain,and it was rainy,besides sleepy,,,started hitchhike 5 PM,Thanks taxi-driver!? then,hard to catch,,,arrived to Koblin and met host 11 PM. napping in fortress,then,met CSer,,,it's hard to talk with someone who is eating food as I'm always hungry. Hitchhike from 6:30 PM.Many hitchhikers were at same point,everyone succeeded sooner or later and someone new were coming one after another,,though,only I couldn't catch for over 3 hours,,,arrived Baranovichi at 0 AM. Too tired and too sunny day,stayed at host for long.Authority of hitchhike Anton's book is interesting but,,Why do we need study or school about hitchhike?? 2 hours walking,hitchhike from 7:30 PM,,,after sunset,I nearly gave up,then, SINCE BEFORE ENTER EUROPE,FINALLY I NEARLY DECIDED KNOCKING DOOR AGAIN! ?,,but speedmaniac picked me up,,Minsk at 0 AM. Kasia is too nice CS-host,too much is always not best as long as I'm not so nice. No time in Minsk anymore,so I made a plan of 4 meetings,it was strongly sunny (+30c),as result,most of them I was late to come. Visted Ilya and Marina again,wacthed Japanese movie "Okuribito" together,,wonderful movie. More meetings,,Why I still can continue? then,I saw off the precious person at platform of station,,it's second time in Minsk?!? After 0 AM,surfed famlily,,but they're interestd in my story until 2:30 AM. Even more,still more meetings,then I left family hosts,,No!it's too comfortable I can't!? they might be hypnotizing me? but anyway my Belarusian visa is valid until tomorrow,so at least I should leave Minsk today,now it's 8 PM,but Go to start hitchhike,,?!!? Gomel'CS-host told me "we're in forest now,if you will come,we'll go back to Gomel"by phone. I left Minsk'host at 20:00,,metro,,walking to surburb,,caught a car 21:45,nearly asked him to host me,but didn't. In the darkness in countryside,3 guys who are going to go to Gomel picked me up with beer,,phoned Gomel'host "Oh,I didn't think you'll come"?! Suddenly guys stopped the car and said "we'll go back to Minsk,bye." Suddenly,knockings doors or camping out in the small city Bobruisk? It's 0:00,I remembered here is Kasia(one of Minsk'hosts)'s hometown,,I phoened her,,but she was here! met and took me to her parent's home,,miraculous. Nice Sunny hitchhike,nice couple drove me to Gomel and showed me super nice green park nearby big river! Tried again phone to CS-host"I'll finish job at 5pm",,rest nearby street,,phone again"still work until 6pm",,so I left Gomel and hitchhike,,walking the border between Belarus and Ukraine was 2km around,,21:00,Belarusian driver picked me up but slow speed,,with passing through the region near Chernobyl,told me his mother died by its disaster! ?,,he seems sleepy,me too but we try to not sleep,it's a kind of silent competition,,Almost 0:00,arrived to a metro station in Kiev.